After AzhwAr mentioned “nIyE aRi” in the previous pAsuram, emperumAn asked him “In this expansive world is there no one who knows about this?”. AzhwAr responds saying “in this world which is full of ignorant jainas, the confused baudhdhas and the lowly Saivas, all of whom either do not accept vEdhas or give wrong interpretation to vEdhas, who would know you truly?”. If one were to ask “There could be people similar to the mudhal AzhwArs (the first three AzhwArs) who are totally devoted to emperumAn; why then is AzhwAr saying that there is none?”, the answer would be that AzhwAr, while knowing that there would be a few such people, is disgusted that the world is full of these ignorant, confused and lowly people only. Thus there is no incongruity in saying that there is none. aRiyAr samaNar – jainas are those who say of entities “syAdhasthi, syAdhnAsthi, syAdhasthi cha nAsthi cha, syAdhasthIthi vakthavyam, syAdhnAsthIthi vakthavyam, syAdhasthi cha nAsthi chEthi vakthavyam, sarvadhA vakthavyam cha ” – 1. It (entity) may exist. 2. It may not exist. 3. It may or may not exist. 4. It may be said that it may be present. 5. It may be said that it may not be present. 6. It may be said that it may or may not be present. 7. It can be said in any way. Thus the jainas who talk with seven possibilities about an entity do not truly know an entity. Aren’t the jainas the type of people who would say that a pot exists looking at it and would say that it does not exist [once it is removed from its place] and would say that anything can be said about anything. aRiyAr samaNar – is it required to say that jainas do not know anything when they talk in contradictory terms similar to a son saying that his mother is sterile [childless]? It is pertinent here to recall SrI parASara bhattar’s SrI rangarAja sthavam SlOkam “angIkruthya thu sapthabangi kusruthim syAdhasthi nAsathyAthmikAm viSvam thadh vibhavam jagajjinamathE naikAnthamAchakshathE I binnAbinnam idham thathA jagadhushE vandhyA mamAmbhEdhivathnUththabrahmavidhE raha: paramidham rangEndhra! thE chakshathAm ” (Oh SrI ranganAtha! In the philosophy of jainas, who follow the wrong path which says that an entity may exist or may not exist, they say that all the worlds which are your wealth are of many types. Let those jainas instruct this most secretive message to the bhEdhAbhEdhi vAdhis (those who say that entities are different as well as not different) who are the modern brahmagyAnis (know very well about emperumAn (this is a backhanded compliment)) who say that this world is same and different, similar to saying that my mother is sterile). ayarththAr bavuththar – baudhdhas are also without knowledge. This is because they do not accept AthmA who is the knower. They consider knowledge also as transient. Is there any possibility for such people to know about Isvaran (emperumAn)? sivappattAr siRiyAr – those who are engaged with Siva are lowly in their knowledge. These people (followers of Siva) accepted pramANam (authentic texts such as vEdhas) in a peculiar way. Unlike the jainas and baudhdhas, they accepted the vEdhas. But since they also accepted Agamas, which are confusing texts, as authentic, they do not know the supreme entity who is manifested by the authentic texts. While all the vEdhas affirm that supreme being is the determining cause as well as the materialistic cause for creation, the Saivas say that he is only the determining cause. 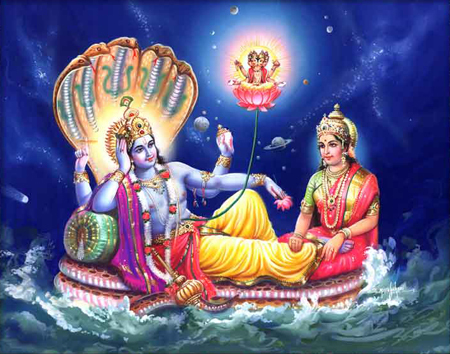 Even while establishing as to who is the supreme being, they considered a human instead of nArAyaNa. While the King of Kings is available, they went for a mendicant; while the one with lotus eyes is available, they went in for one with disfigured eyes. Hence these people are with lowly knowledge only. veRi Aya – “sarvagandha:” (one who has all the fragrance) – emperumAn is the epitome of fragrance as praised by vEdhas. This implies his unparalleled enjoyability (having the best quality among those qualities which are fit to be enjoyed). Even flowers have sweet fragrance. What is the eminence in emperumAn having this quality? mAyavanai – one who has amazing activities. One who has basic nature, qualities and wealth which create a feeling of wondrousness. Since he controls prakruthi which is called as mAya due to its wondrous qualities, emperumAn is called as mAyavan. It is pertinent to recall the vEdha saying “mAyAm thu prakruthim vidhyAnmAyinam thu mahESvaram” (know that prakruthi is mAyA and emperumAn is mAyi). Even though he is one with amazing activities, is he without empathy? mAlavanai – one who is the epitome of affection towards his followers. mAdhavanai – on top of all these, one who is the consort of SrI mahAlakshmi. She is the university where he learnt how to be affectionate towards followers. EththAdhAr – these people (earlier mentioned jainas, baudhdhas, Saivas) do not worship. AdhalAl InavarE inRu – Since they did not worship [the supreme being] they remain as lowly people. (veRiyAya ….. EththAdhAr InavarE) – are those, who do not worship the unique enjoyable entity, great? (mAyavanai EththAdhAr InavarE) – Are those, who do not praise the amazing entity, great in knowledge? (mAlavanai EththAdhAr InavarE) – Do those, who do not praise the epitome of affection, have a good heart? (mAdhavanai EththAdhAr InavarE) – Is it required to call those who do not praise even after seeing the wealth of SrI mahAlakshmi, who is the epitome of mercy, as lowly? inRu InavarE – Since they are qualified to become elevated as devotees of supreme being at some point of time in the future, AzhwAr says that they are lowly, as of now. We will move on to the 7th pAsuram next. This entry was posted in iyaRpA, nAnmugan thiruvandhAdhi on June 22, 2018 by T N Krishnan.